This week, Twitter officially confirmed that the social network is testing an expansion on the original 140 character limit of tweets to 280 characters. After the announcement, Twitter CEO Jack Dorsey and cofounder Biz Stone took to Twitter to acknowledge and further back the move to longer tweets, citing that the change could encourage more user activity. For now, the social network will only be testing the character count expansion in small, global groups. Will an increase in characters really result in higher engagement and more frequent tweets? According to Twitter’s math it will, and that is primarily because they feel users are constantly frustrated by the limits of a single tweet. However, this has been resolved through threaded tweets, tweetstorms, or a more lazy option: taking a picture of text. 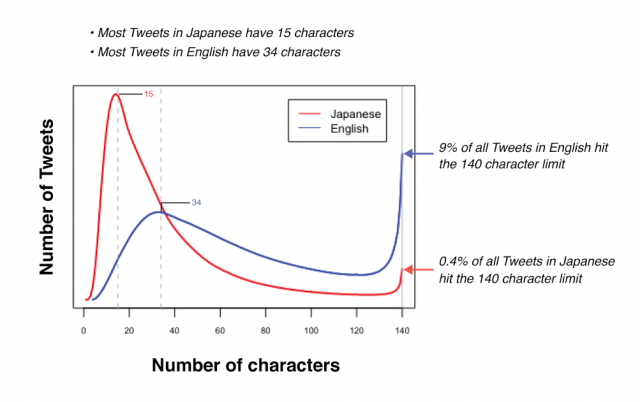 Twitter is also correlating that, because nine percent of English speaking Twitter users run up against the 140 character limit versus only .4 percent of those in Japanese, that this may be an indicator of frustration leading to reduced activity. However, they did not reveal any further supporting data that shows if Japanese speaking Twitter users also post more frequently than that of English speaking users. “Sometimes, I have to remove a word that conveys an important meaning or emotion, or I don’t send my Tweet at all. But when Iku Tweets in Japanese, he doesn’t have the same problem. He finishes sharing his thought and still has room to spare,” stated Twitter’s Aliza Rosen and Ikuhiro Ihara in a joint blog post announcing the test. I hear you Imani. The thing is, brevity will still be a huge factor for Twitter, regardless of the character count being 140 or 280 characters. However, based on the information and reasoning Twitter has provided so far, it’s not enough information to suggest that more characters would result in more activity, especially if user frustration is what they are trying to solve. This begs the question, is character count really the most frustrating component preventing users from being more active? Twitter’s test will certainly be enlightening, but chances are that more text in a tweet will have the opposite effect. When Twitter first launched they initially tested a character limit of 160 based on constraints from SMS texting, but they found that usernames impacted how many characters could be used. This finding led to the social network settling on 140 characters. Now more than 10 years later, a shift that would double the amount of characters would drastically impact the network. As a result, users quickly took to Twitter to air their grievances about the new concept, which Twitter was prepared for. In response to Stone’s backing of the test, users gripped that adding characters impacted their understanding of the service. In turn, Stone pulled out a bit of snark. 280 Characters is roughly 50 words. You can read 50 words. I believe in you Caitlin. We all believe in you. As with most tests, there will be bugs. Some users also quickly noted that the current Twitter platform simply does not support the 280 character tweet, highlighting that some of a tweet will now be cut off or truncated. Talk about frustrating. In early 2016 rumors first began to swirl that Twitter was interested in expanding the character count; however, two months later Dorsey denied them. Later the network announced a relaxing of the character count, removing links and images from counting towards it. “It’s staying. It’s a good constraint for us. It allows for of-the-moment brevity,” stated Dorsey in a March 2016 Today Show Interview. What do you think about Twitter testing the new expanded character limit: would you rather have 280 characters, an edit button, or a vastly improved system for removing users that harass others? Here’s what my Twitter followers picked.